August through October is the typhoon season in Japan. A storm by the name of Roke was wreaking havoc as we landed into Tokyo’s Narita Airport last week. Forecasts had me fearing that the whole trip would be a wash out, but luckily the typhoon blew through Tokyo quickly and the next morning dawned clear and bright, though still a little breezy. I hoped that a trip to Yatsu Higata Tideland would throw up a few migrant waders who had pulled over to avoid the northward storm during their journey south, but was highly disappointed in that respect. 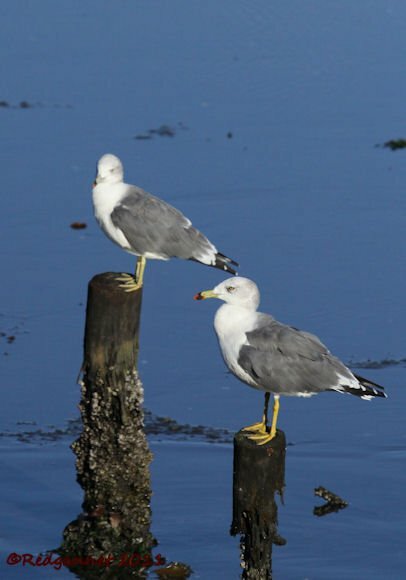 The Black-tailed Gulls, Larus crassirostris, showed well though and I found the first ones sitting on some strategically placed posts as, if waiting for me. 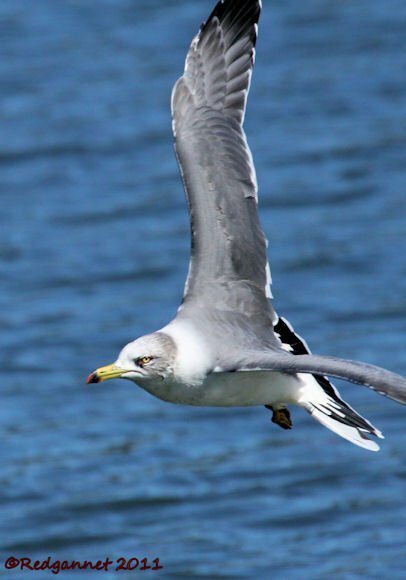 The Black-tailed Gull is being increasingly seen in the USA and two birds have been reported from Washington State already this year. As I write (26th Sept 2011), one is being watched on the logbooms of Commencement Bay, Tacoma, Washington (is that close to where you were recently Corey?). As the name suggests, it is the well-defined, broad, black band on the tail with a white trailing edge and bright white rump that distinguishes the adult bird from any of the other classic larids that are likely to be seen on the logbooms (I believe that the logbooms are quite close to shore, did you notice them in passing Corey?). During its four year maturation, it could be mistaken for a number of other immature larids, so for a definitive identification guide, there can be few better places to visit than Paul Doherty’s photo essay about the species on Surfbirds.com. 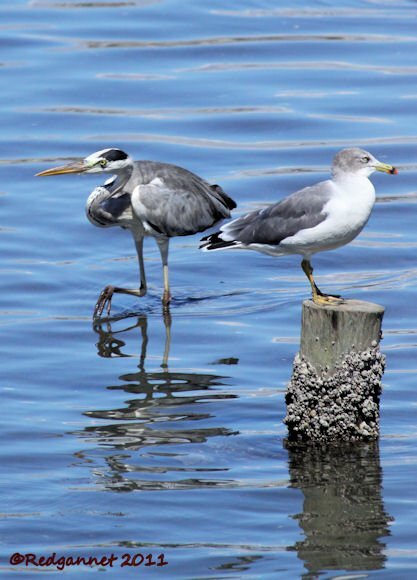 Its best field mark may not be visible if the bird is roosting at a distance, but the individual in question is an adult and the red tip to its bill should distinguish it from its larger cousins. 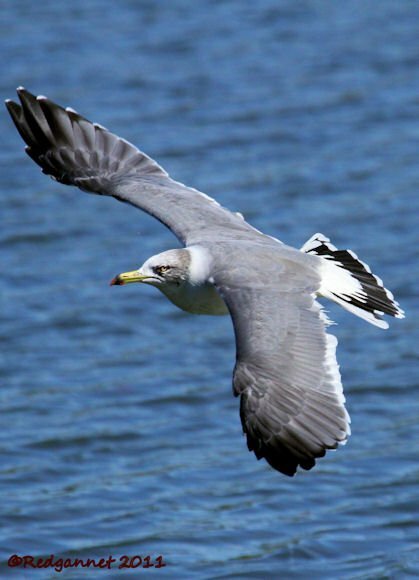 In case of confusion with a California Gull, which is likely to be its closest match, the pale eye is visible from a good way off. Paul Doherty’s post leaves me with little to add except for a link to the airline schedules for anyone who may be considering a flight from New York back to Seatac. Ah, the Black-tail…I was really hoping for one when I was living in the Western Aleutians last year, but had to make do with Black-headed, Slaty-backed and Vega Gulls (cue world’s smallest violin now). Redgannet, if a Black-tailed Gull in Vermont in 2005 weren’t my first-ever twitch I would be so ridiculously gripped off.